Anri Sala, 'The Present Moment (in B-flat)', 2014 © Anri Sala. Courtesy Galerie Chantal Crousel, Paris; Marian Goodman Gallery; and Hauser & Wirth. 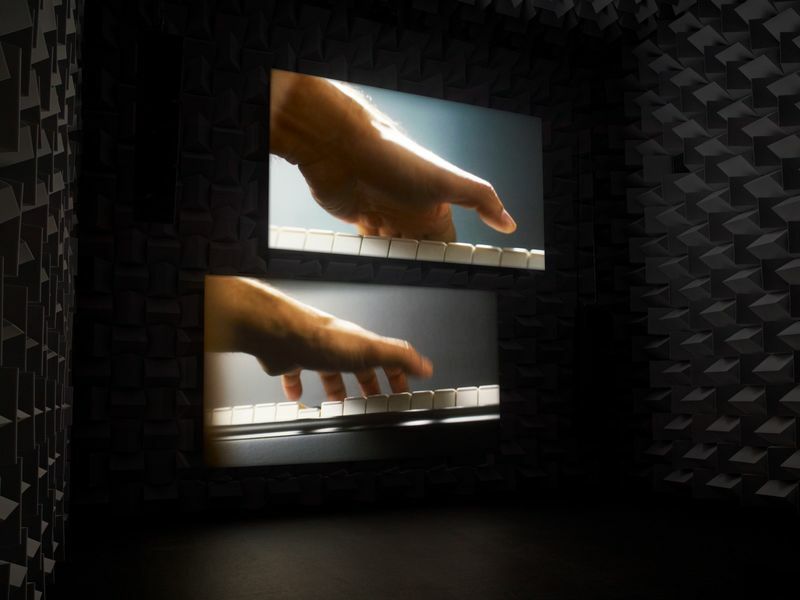 Anri Sala’s sound, vision, and sculptural installations feel like they want to exist whether or not anyone is there to hear or see them. Like the entranced drummer in the work that lends the show its title (‘Answer Me,’ 2008), Sala is not concerned with conventional conversation. His childhood in the closed society of Enver Hoxha’s Albania seems to have inoculated him against authoritative speech in favor of a kind of self-institutionalized performativity, one that can deliver a more personal, perhaps post-historical actuality. 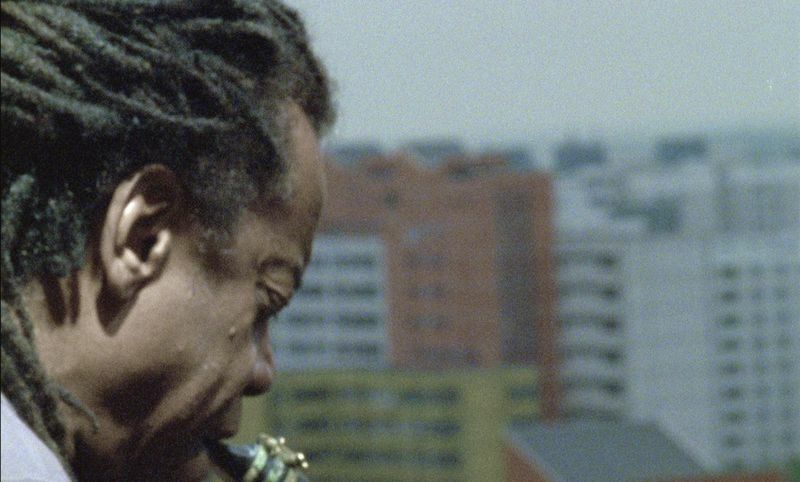 Sala alludes explicitly to this process of realizing the limits of official language in one of his first video works, ‘Intervista (Finding the Words)’ from1998. In it, he interviews his mother who simultaneously views historical footage of her younger self as a committed (Albanian) state communist. Since the original footage was silent, Sala sought to reconstruct his mother’s language (the mother tongue) through lip-reading interpreters. Her reaction to ‘hearing’ how didactic and robotic she sounded as a party faithful offers a poignant, localized critique of the fallacy of ideologically determined speech. In this foundational work, Sala establishes his highly equivocal relationship to representational histories in word and image. ‘Answer Me’ appropriately relies upon similar strategies developed to detach representations from their official function, and in this process to reckon with the phenomenal self-evidence of embodied sound and image. Anri Sala, 'Long Sorrow', 2005 (still). © Anri Sala. Courtesy Marian Goodman Gallery; Hauser & Wirth; Galerie Chantal Crousel, Paris; Johnen Galerie, Berlin; and Galerie Rüdiger Schöttle, Munich. Sala approaches this task by oblique glances. For instance, a glinting tension arises from the artist’s close-up capture of subtle bodily gestures: the tentative thumb on the hapless music box grinder shambling though a park in ‘Le Clash’ (2010); the elbows and fingers of the dual cellists in ‘The Present Moment’ (in B-Flat) and (in D) (both 2014); the jazz musician Jemeel Moondoc’s intense, weathered face and eyes that dominate one section of ‘Long Sorrow’ (2005). Enveloping these vignettes of the human, the artist intercuts layers of architecture and music to compose moodily portentous environments. The elastic speed of sound that envelops these signifying intervals modifies the syntactical recurrence of images in Sala’s work. By keeping his protagonists’ repetitive gestures and glimpses of architectural place suspended in sonic deconstruction, the artist forecloses the logical synthesizing process of visual dialectics. In doing so, he refuses the viewer’s projection of a fixed self-identification onto these agents. His method sets in motion a constant slippage between sound, image, and the architecture of specific place, reminiscent of such tactics in Douglas Gordon’s appropriated narratives and Jane and Louise Wilson’s somber reflections in historically over-determined architectural sites. Yet Sala has his own distinct filmic style. Besides his art-world influences, his aesthetic freely incorporates the distilled essences of Tarkovsky, Godard, and Malick, in a dreamy, ascetic mix. In the twin-screened ‘Ravel, Ravel’ (2013) the viewer is presented with two distinct performances/versions of the Ravel concerto for the left hand, originally composed for the pianist Paul Wittgenstein (brother of the philosopher Ludwig) who lost his right hand in combat in WWI. The dual videos close in on two different piano keyboards and players. The simultaneous performances of the piece at times overlap in ways that transform into a third, meta-harmonic composition. Wittgenstein altered Ravel’s piece himself (to the composer’s abiding consternation), so the composition comes with a readymade provenance of deconstruction. This must have been one of the facts that attracted Sala to detour the score to his own poetic purpose. Not only is Ravel’s work a de facto outcome of war, necessity, and the ingenious will to sonically surmount this traumatic history, but also evidence that the strong poet/player must further interpret such a piece to their own, internally present, ear. The ‘official’ author of the piece does not become the ultimate arbiter of how it might be performed. ‘Ravel, Ravel’ is a key allegory for the way in which Sala positions himself as a provisional witness to his own contingent, authorial reflection. 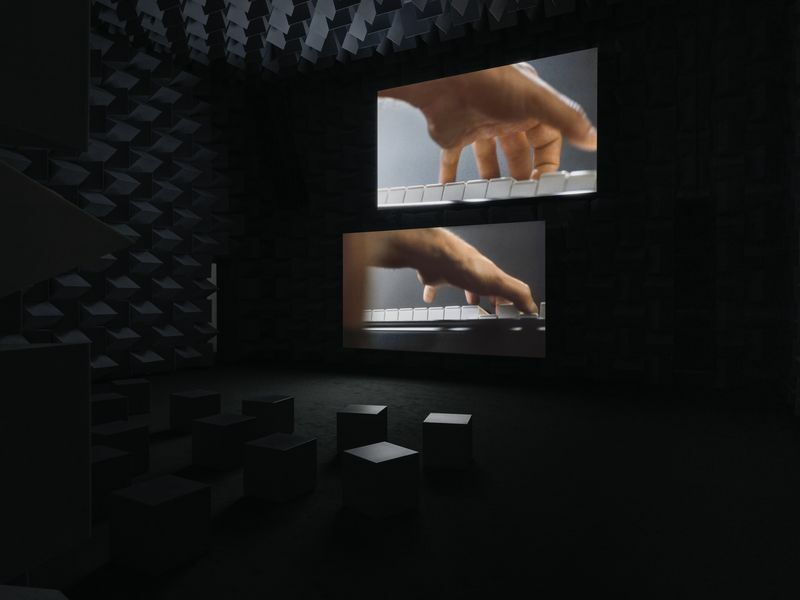 The fact that Sala situates the videos inside a monumental anechoic chamber (a technical structure of acoustic foam scientifically developed to absorb any echo) reinforces his intent here, as in the rest of the show, to deflect the spectator’s (and his own) outer-directed perceptions toward a more localized, bodily awareness. In situ, the body itself becomes an inescapably local sound chamber of content. Sala’s work directs us to hear the whispering murmur of sentience, the infinite conversation of primary being, beyond both authoritative institutions and the paradox of self-institutionalization. The artist further problematizes ‘Ravel, Ravel’ by exhibiting, in an adjacent room, an earlier, related sequence in ‘Unravel’ (2013). In it, a lone DJ, the French electronic music artist Chloé Thévenin, works two turntables in the German Pavilion at the 2013 Venice Biennale. Each vinyl disk she manipulates represents one of the two versions of the Ravel performance. Her seemingly harried attempt to sync the two is an analogy for the viewer’s vain desire for the easy resolution of dialectical synthesis, a desire the artist repeatedly complicates in almost all of his work. Sala is nothing if not impeccable in his conceptual references in this particular pairing of installations, which nevertheless manage to visually and aurally transcend their determinate, historical sources to become the artist’s engagingly present chef-d’oeuvre of the show. Despite the predominance of video screens ‘Answer Me’ feels very sculptural. A third dimension of sound literally and figuratively permeates the different rooms of Sala’s installation at the museum, often forming incidental compositions from the leakage between. This sculptural sound effectively haunts the institution in a way that is neither self-aggrandizing, nor falsely humble (although in at least one instance, Sala gets a bit too heavy-handedly literal: Still life in the ‘Doldrums (d’après Cézanne)’ (2015)). When Sala does succeed in abstracting a phenomenal gravitas, he manages something very rare in contemporary art—the enchantment of the antiseptic white box of the post modern museum with anxious shades of the spectatorial present. 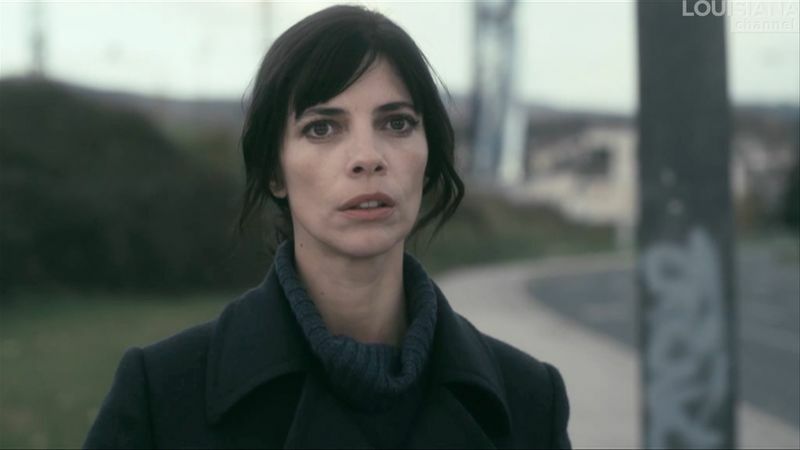 As Manet’s world-weary maid (her back to a mirror) in ‘A Bar at the Folies-Bergère’ (1882) purposefully absorbs her patrons’ superficial gaze with her own opaque stare, so Anri Sala demands of his viewers an extended look, past insipid scanning. His anechoic mirror arrests reflexive narcissism by keeping the determinate surfaces of his works troubled by the rippling syntax of sound and image, thereby cancelling any shallow echoes of optical desire and, perhaps more importantly, the vain necessity for authoritative reification.